PRISMs to Power the UK. : 38DEGREES - How to get PRISM under the Public's Skin? 38DEGREES - How to get PRISM under the Public's Skin? 50,000 votes is what we need - Only 49,983 to go! You 49, 682 people out there, worrying about nuclear waste - all you have to do, from this day forward, is regard it as the most valuable energy asset this country has got at its disposal. Vote for a fleet of PRISM reactors. Give the UK 500 years of energy security. Cut our carbon emissions to practically 0%. Give your children and grandchildren an energy-rich future in a world which is free of dependence on fossil fuels, peaceful and stable - even when there are 10 billion of us. 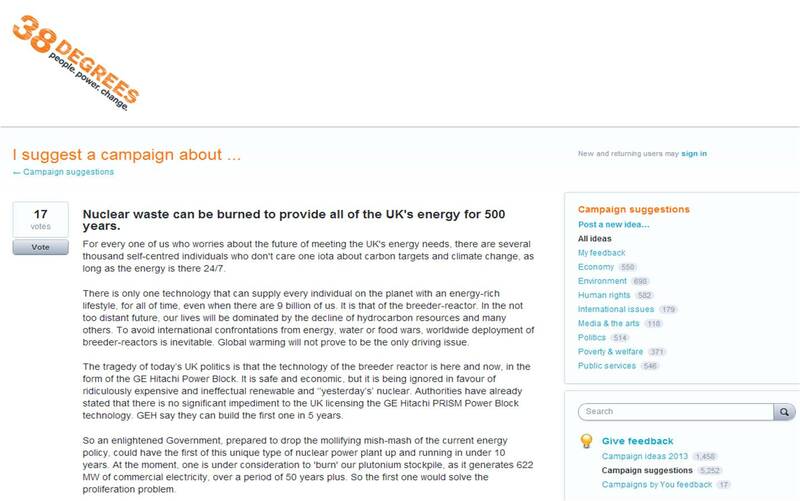 The link for voting for the PRISM Campaign is: Nuclear waste can be burned to provide all of the UK's energy for 500 years.